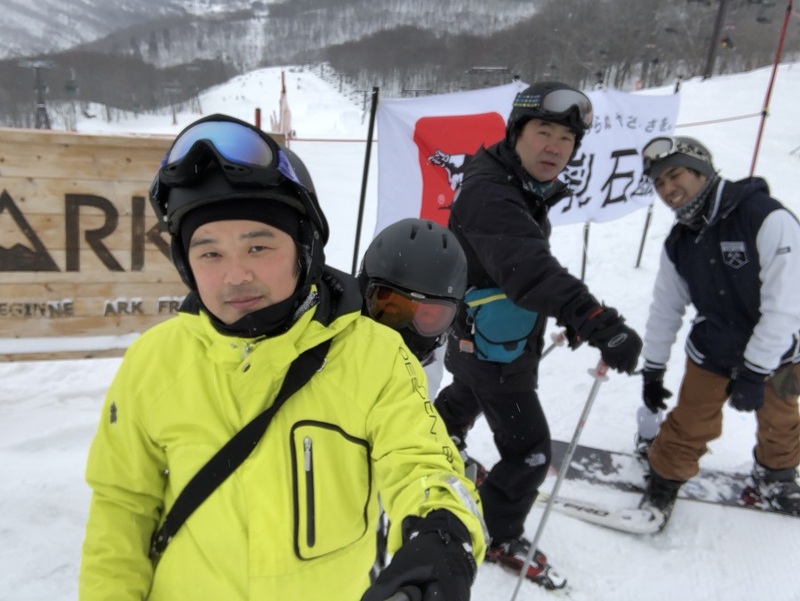 On a particular day in March, convinced that now was our last chance to ski during this season, we travelled to Hakuba Goryu ski resort in Hakuba, Nagano Prefecture together as the ski club. Participating members for this mid-season – despite having to adjust their work schedules – were the vice president of our company, Mr. N the artist, and myself. And so, my wife and 1-year-old son (the cutie-pie), joined to make a total of 5 people in our group. In order to make the schedule easier to set up, we decided to: use a car to for the journey, depart at a set time on Friday, sleep in the car, hit the slopes on Saturday, and head home during the same day without staying at a resort. And thus, without specifically mentioning that the latter half of the list was for myself, we decided to go to Hakuba Goryu ski resort. However, because it seems that our driver didn’t have the energy for such an early trip, we decided to sacrifice the young Mr. N as our driver for the early morning trip instead. The day finally arrived. Since my wife and son (the cutie-pie) arrived a bit later, we ate dinner at a nearby Chinese restaurant and went on our way. I’ll also avoid mentioning that the vice president said something like, “I’m going to pay for this (dinner),” and then realized he had no cash in his wallet. We all ended up paying separately. It was a completely needless concern. From Mr. N’s intriguing work history (“I used to make cardboard rolls.”), to a comic-like episode during the vice president’s days as a TV man (“I will tell you out of respect for your courage”), to stories of other episodes at work that I can’t write about here, it was a very exciting ride. Still, regardless of the excitement, I made it a point to remain cautious of my wife’s use of casual speech to the vice president. At 1:30 AM we arrived at Hakuba Goryu ski resort and immediately adjusted the seats to bed mode. By the way, my family’s Toyota Hi Ace van has camping car features. You can stretch out your legs and sleep, and it has an heater that allows heating even when the engine has stopped. So please at least let me brag a bit. After all, it cost me one hell of a loan. We took out our sleeping bags and agreed that we should rise at 6:00am to prepare for our morning ski. But he arose at 6:10 the next morning. We made the various preparations, and headed to the slopes just after 7:00am. Since the daycare center opened at 9:00am, I decided to wait with my son (the cutie-pie) in the car. We took the opportunity to watch an educational TV kids show by NHK that we had recorded. When the day care center opened, we dropped off my son (the cutie-pie) and the 4 of us headed to the slopes. The slopes went well and favourably, so there’s not much to write about during this time. As you might expect, skiing from 7:00 AM was pretty tiring, and by the afternoon the vice president and my wife had returned to the car. The two of us remaining decided to make a few final runs and call it a day. We skied a little longer and returned to the car. When we opened the door, we found the vice president in front of his MacBook and seemingly taking care of some emails. He let out a tiresome groan. We quietly closed the door; fearing we might get caught up in work talk. After that, all kinds of things happened. From eating parfaits as per requested by Mr N (who would be more than happy to eat them again once more), to going to the pizzeria near the parking area that we visited on the vice president’s recommendation, but were unable to enter as it was rented out for a private party. But all in all, this was the perfect outing for the ski club. When going out with co-workers, I understand that it can be difficult to balance the two sides of work and private life, but for 24 hours I had the pleasure of crossing the borders.